*Please be aware that Reef Sleep only accommodates 8 people and is generally booked months in advance. At 3 pm Seaflight departs Hardy Reef for the mainland leaving the Reefsleepers (maximum of 8 people) plus diving instuctor and chef on the pontoon. Peace and serenity settles over the reef and the sounds of seabirds and lapping water have a powerful calming effect on all present. 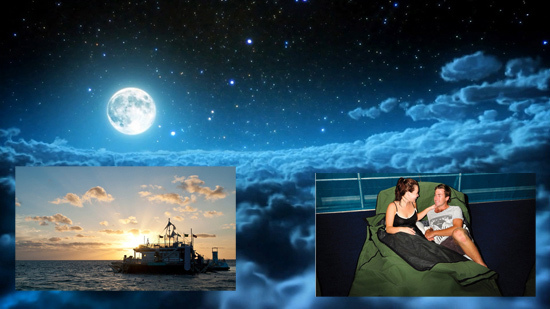 Then the reef takes on a different life as sea turtles come to feed on seaweed growing on the sides of the pontoon and more stars than you ever thought existed fill the night sky. 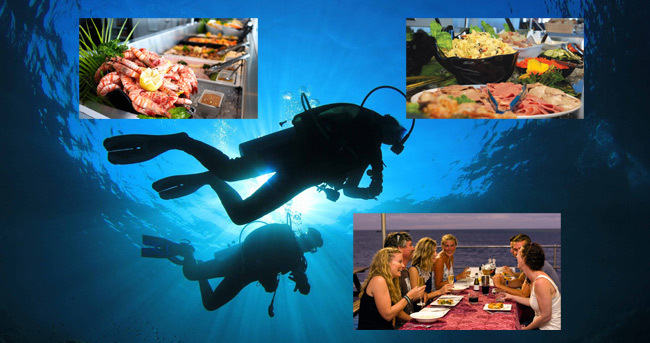 The evening meal set up in a barbeque, smorgasbord style is ready and afterwards enjoy the ambience of the reef at night. Then shower and bed under the stars in your weatherproof and comfortable swag. Breakfast is followed by more tranquil atmosphere during which time you can opt to snorkel with your group. You will have time to visit some special spots where you can see giant maori wrasse and spectacuar coral formations. Reef fish, turtles and reef sharks may all make an appearance at this time. If you're not a keen snorkeler then this a great time to have the underwater viewing chamber to yourself and watch the other members of your group as they snorkel in the calm reef waters. 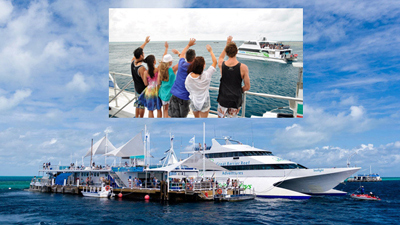 Then at 11 am Seaflight returns with the new group of day guests and after another day at the reef you return to the mainland departing at 3 pm and arriving in Airlie Beach at 6 pm. Included in the Reef Sleep package are lunch and dinner on day 1 - breakfast and lunch on day 2 - morning and afternoon teas both days with free tea and coffee available throughout the day.There is also a bar with a full range of alcoholic and non-alcoholic drinks. Reef Sleep accommodation is unique featuring two types of weatherproof swags. A swag is a cosy low tent with a clear viewing panel overhead, comfortable mattress and very snug and comfy bedding. Swags can be king single for individuals or doubles (for two people sharing). The experience of sleeping under the stars in a swag on the Great Barrier Reef is absolutely incomparable.